If you’re among those casino players who can’t get enough of online slots inspired by famous movies, Six Million Dollar Man is exactly what you need. Developed by Playtech and already live in most casinos powered by their software, this game accurately recreates the atmosphere from the famous TV series. It adds a maximum payout of 4000 coins per line, and with plenty of bonus features in store, there is a lot of money to be made. The 50 pay line slot game closely follows the storyline in the movie, which explains why Steve Austin has been chosen to represent the wild symbol. A brief summary of all significant features, free spins, bonuses and the payout structure can be found at http://www.heaven4casinos.com/casino-software/playtech-casinos/million-dollar-man-slot-game/. Those who have watched the movie know that the former astronaut was transformed into a bionic man, with brand-new legs, a bionic arm and eye. His new appearance made him suitable for espionage, so he embraced his new job as a secret agent. The background of Six Million Dollar Man Online is eerie and Playtech did a great job in fully immersing players into this unique setting with appropriate symbols. These are depicted by his bionic arm and legs, low-paying card symbols and many other objects that spies are supposed to use in their missions. 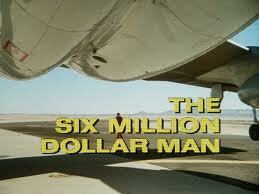 The Six Million Dollar Man logo is the scatter symbol and three of them are required for free spins to be triggered, with the initial amount being of 15 such spins. When the Bionic Spin feature is active, the number of free spins can be increased and the payouts are also boosted. The mini game consists of a gathering frenzy, in which players need to collect the bionic limbs and eye to unveil different prizes before the time runs out.